Imagine this: a somewhat conventional front yard, barn-red cedar siding. Three small steps to the front door. From the road, off to the left, you see a number of small fruit trees...apples mostly, and a peach, maybe a pear...And a sizeable red shed toward the rear. In my permaculture mind, I call this area "the orchard." Just past the shed (to the right, in the picture below) is a wide open sunny area, bordered by the neighbor's small Arbor Vitae trees, perhaps 1/4 of an acre. The ground covering is mostly clover, some interesting weedy tap-rooted plants that I don't know their name, lots of plantain, and a bit of grass. Beneath this is the septic leach field, so it must remain an unbuilt area in case there are ever problems in the future. We hope next year to have a couple dairy goats grazing here. This is "the pasture." We love the shed. At 10x16, it's a great size to hold our new lawnmower, a reel-style mower made by Fiskars, and lots of other stuff. Reel mowers are powered by humans--you just push, and the blades cut. That's it. It's light and easily maneuverable, and I love it. I also have all my garden tools and supplies, soil amendments, potting materials, apple crates, and more in there. Looking directly at the front of the house, and on either side of the driveway, you see grassy areas and perennial flowers and bushes. Honeysuckle, poppies, anise hyssop, and so many plants I don't know yet... In my mind, in the future, this area has more wildflowers and transitions into the orchard with an area of currants and gooseberries and hazelnut trees. I imagine this area to be "the meadow." 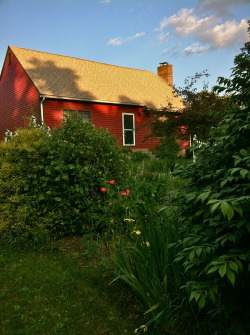 Standing by the raspberry patch, and turning toward the rear of the house, you see that the rather conventional front is complemented by a more modern back. The second floor is almost entirely a continuous dormer, giving the backside a contemporary feel. On the ground level, sliding doors open out onto a large cedar deck--where we've got some folding chairs and apple crates, and our new grill. The grill is kind of a funny thing--it's such a suburban icon, but to us it also meets a key permaculture principle: redundancy. Our kitchen stove is electric, and should the power go out, we know we can heat hot water and cook food on our gas grill. I also want to build an outdoor firepit as a secondary backup. But one of the main ideas of permaculture is close observation, and I need to closely study the land and our use patterns before I build anything more permanent. I didn't mention some of the less desireable aspects of the homestead--our mole in the front yard, the squirrels and chipmunks who are very much at home in the gardens, and the Rose Chafer, a new bug for me--a lot like the Japanese beetle, overwintering in the ground and emerging late May-early June to eat as much flowers and leafy material as possible. I spent a good 7 hours the last two weeks picking Rose Chafers off of the raspberry leaves and grape leaves and honeysuckle leaves and and and and dropping them into a container of soapy water, where they drown. It's an unfortunate task. Hopefully we will have less of them next year, as almost all of the ones I got were mating. Fewer mated bugs=fewer baby bugs next spring. At least that's the hope.